Few boatbuilders put together a big boat with big-time performance quite like Overmarine. 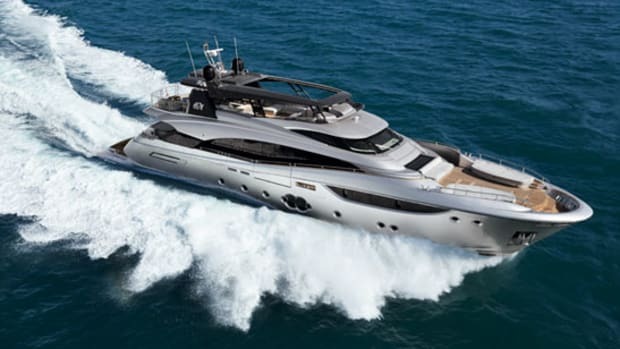 The Mangusta 105 matches a pair of 2,400-hp MTU diesels to water jets to offer impressive speeds with considerable luxury. 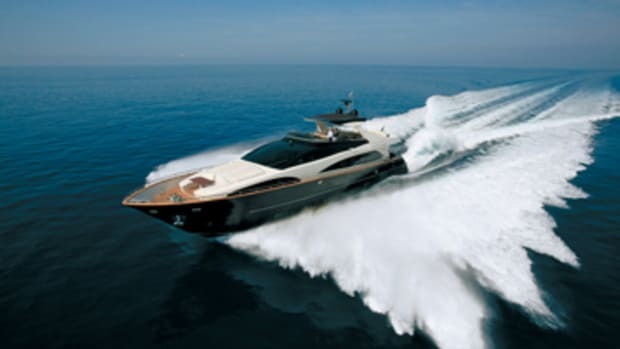 Mangusta builds a boat to kill a cobra. It’s a great story. 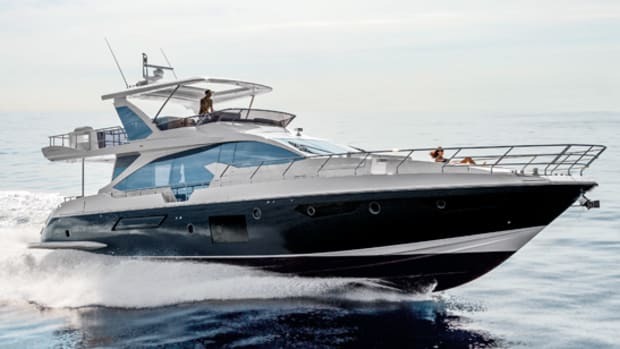 In 1985 a marine-electronics engineer named Giuseppe Balducci set up Overmarine after having spent years servicing the shipyards of Viareggio and deciding he could build boats too. The boat to beat in those days was the mighty Tecnomarine Cobra—and what eats cobras for breakfast? A mongoose, of course. 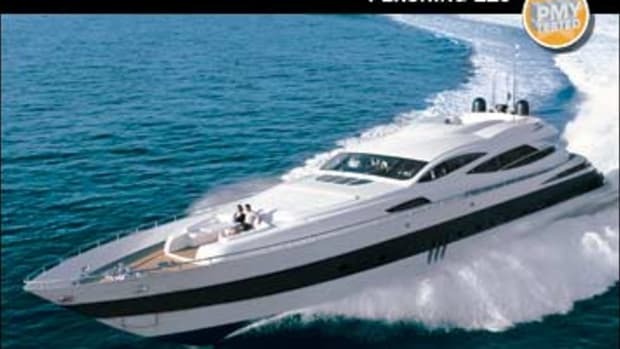 Thus was the Mangusta brand born. Like most great stories this one is absolutely true, and it is given added poignancy by the fact that Tecnomarine has now disappeared while Overmarine occupies a prominent waterfront site in this fabled capital city of Italian yacht-building. 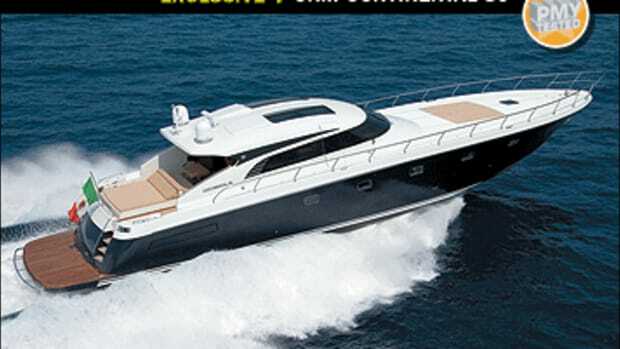 Its first product was an 80-footer, and outrageously big and fast motor yachts became the shipyard’s stock in trade. Secured to the quay in front of one of the massive assembly sheds, our 105 test boat was dwarfed by Mangustas on either side, but in any other setting the powerful, 103-foot 95-tonner is a very substantial vessel indeed. 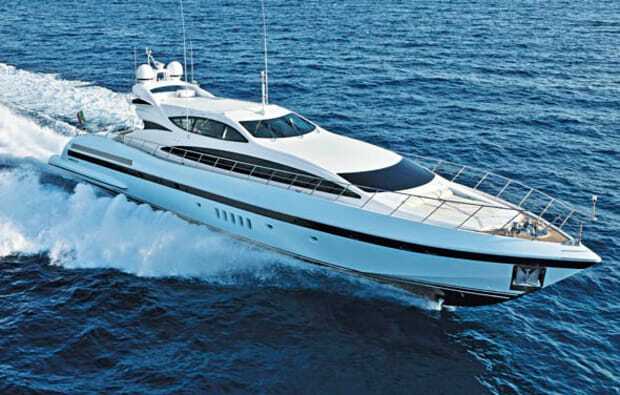 The Mangusta 105 is a popular model. More than 30 have been built. 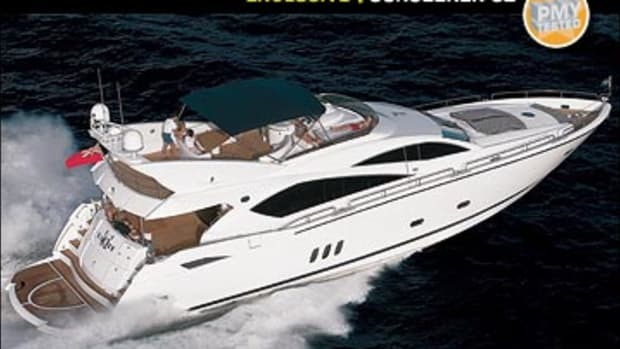 Ours was the first of the Mark 2s, with a completely restyled superstructure molding, but the winning formula is otherwise not much altered: big engines, big interiors, and a big personality. The smallest boat model built by Overmarine is a 72, and with the 80 these are the only surface-drive models in the lineup. Everything else has jets, and the 105 has two 2,400-horsepower MTU V16s to drive them. One glance at the helm console is enough to confirm that this is no ordinary motoryacht—thanks to the various management and override systems built into the Rolls-Royce KaMeWa propulsion electronics there seems to be twice the usual number of screens, dials, gauges, and monitors, and the control units themselves look worryingly unfamiliar. 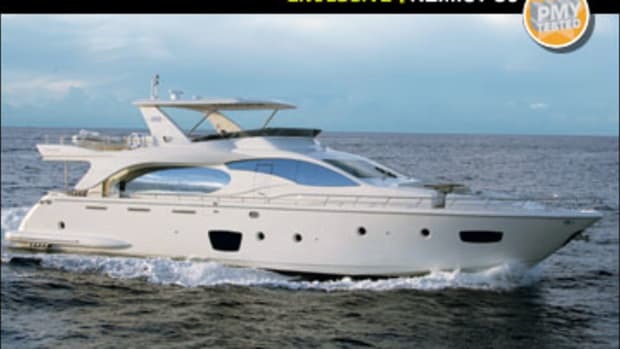 In fact, taking the helm of this motoryacht is remarkably straightforward. There is a conventional wheel—with one-quarter turn lock to lock, this being a pure fly-by-wire set-up—but the control units are the way to go. With engines and drives synchronized to one unit, a simple one-handed twisting action steers the boat, and the throttle lever is right at your fingertips. It seems an extraordinary way to exercise control over such a powerful machine, but it works beautifully and takes just a few minutes to get used to. It helps, of course, that the 105 is superbly balanced, equally responsive to both throttle and helm, and for something of this size and displacement, a positive joy to drive. As a long, lean, V-bottom hull—deadrise at the transom is 15.5 degrees—it does have a significant planing hump to get over, and you need to be bold on the throttles to power through the transition. Once up and running I found minimum planing speed to be a comfortable 20 knots or so. 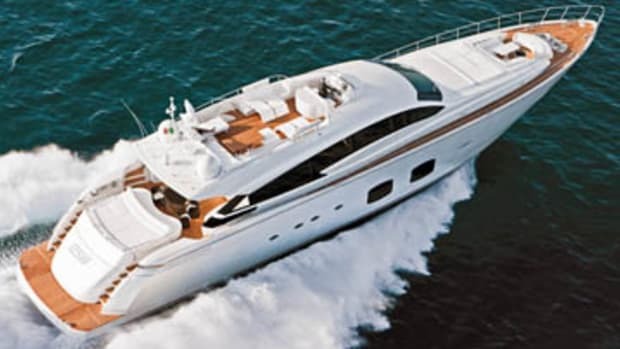 At 25 knots the big Mangusta was relaxed in the cruise. And cruising is what the 105 is all about—with a generous fuel capacity it has nearly a 500NM range at 20 knots and not much less at 25. Our 33-knot maximum on the day reflected the best part of a season’s growth on the hull. According to the engineer, we could expect 35 knots with a clean bottom. 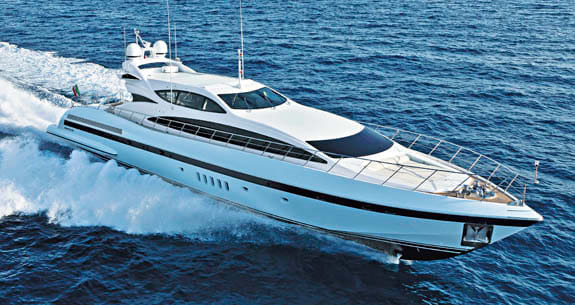 There is no “standard” equipment on a Mangusta. Apart from the shipyard’s selection of machinery and drive systems, all other equipment on board is chosen by the owner from Overmarine’s list of suppliers, which include most of the top brands—and if you want to shop “off piste,” as long as it’s agreed in advance there is no extra charge. A wealthy colleague of mine found this out for himself a few years back when he selected the most expensive gold-plated cutlery he could find. He sent the list through to the yard, expecting a polite refusal in the face of such extravagance, only to receive a phone call asking if he also wanted the fish knives. Our 105 was fitted with an impressive tonnage of entertainment equipment, and finished in a combination of gloss cherry and striped mahogany, with wenge flooring, cream carpets, and leather linings and trim. Quality was exemplary, even in hidden corners. The insides of lockers and drawers were as beautifully veneered and lacquered as the outsides. 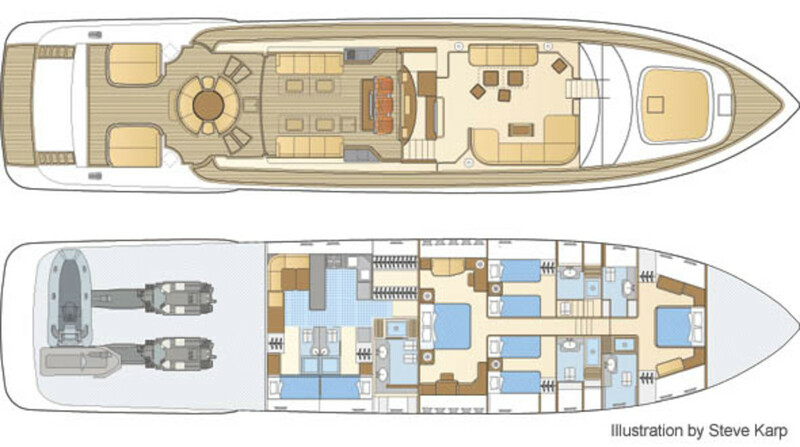 Below decks, the Mangusta 105 has a fairly conventional layout, with a vast, ten-window owner’s cabin amidships, a VIP suite in the bow, and twin-berth guest en suites to port and starboard, each with an extra fold-down Pullman berth. Headroom right through the lower accommodation is an impressive 6&apos;8", and the berths are all full size—even the singles are 30 inches wide. It’s a similar story aft where the crew accommodation and galley are roomy and comfortable, with a pair of twin-berth en suites and a generous mess. The grab-handle by the cooktop is a nice seagoing touch. Further aft, the engine room also seems huge, even packed with gensets and air conditioning and watermaking equipment—as if the MTU V16s weren’t enough—with good headroom and walkaround space. A great lower deck, then—but this isn’t the real story of this spectacular yacht. 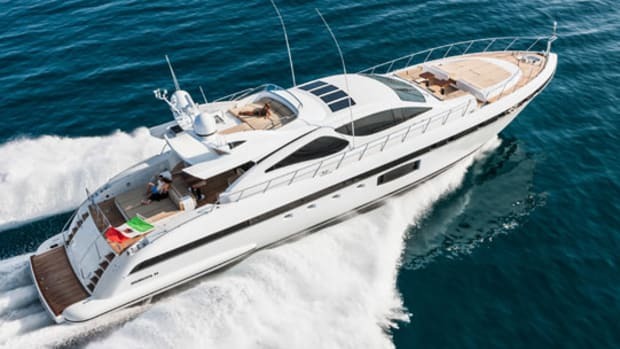 The Mangusta 105 is one of the shipyard’s best sellers, and according to Overmarine a major reason is its main saloon, which is not where you’d expect it to be. That deck seating area aft of the helm is a comfortable and sociable place to sit and watch the world go by, if that’s what you want to do. But if you need a little family time or want to entertain some business associates, you’ll find the main saloon much more amenable. Forward of the helm and down five steps, it has windows on three sides and offers plentiful views. And it cannot be seen from the stern—so even moored to the quay you can enjoy your yacht in privacy, far from the madding crowd. It’s one of those clever quirks that makes a huge difference, and helps establish the character and personality of the 105. It might seem a small thing—but isn’t that what the cobra said about the mongoose? air temperature: 66ºF; sea temperature: 68ºF; humidity: 61%; seas: 1&apos;; load: 790 gal. fuel, 370 gal. water, 6 persons, 300 lb. gear.